Posted on August 20, 2014 , in Hot Tubs. In the 20 years or so we have been in business, we have been involved in some gorgeous installations; Everything from 25 story rooftops to flush in ground concrete. Having said that, we also seen some disastrous installations too. 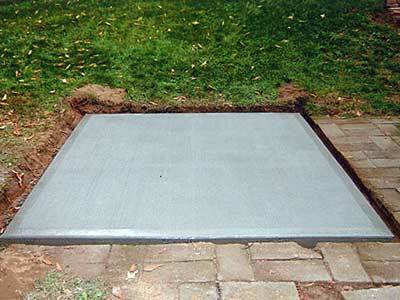 One of our most concerning issues is when a concrete installer slopes the pad. Under no circumstances should a pad be sloped. If you have to slope the concrete around the hot tub because it sits flush along the foundation, that is fine, but the pad itself must be level. The effect of a sloped pad under the hot tub is exponentially exaggerated to the level of water. In many cases, it can affect the water getting into the skimmer and cause cavitation of the tub. In addition, you cannot shim a hot tub. Shimming a hot tub is difficult and requires many long shims with little gap between them, improper shimming of a hot tub will put pressure on part of the cabinet and potentially push up on the spa’s shell. It is best to have a level pad to avoid all of these issues.